This page provides links to information and photographs collected by the local history group and others relating the history of people and places within the Parish. We are keen to add further information. If you wish to submit pictures or words please contact us. We can always transcribe handwritten or audio information. Photograph of the Lowther Arms in Beaumont, taken 1890. Other photographs of local historical interest can be found on our photo gallery. Click here to view details of a short history of Hadrian's Wall. English Heritage inspection report of the monument. Created in 1092 as a bulwark against Scottish invasion across the Solway, the barony of Burgh, comprising the parishes and villages of Aikton, Beaumont, Bowness-on-Solway. Burgh-by-Sands, Grinsdale, Kirkandrews-on-Eden, Kirkbampton, Great Orton and Thursby, has been held by eight great northern families over the last 900 years. Click here to view a brief history of the Barony of Burgh. Click here to view details of the history and remnants of the Carlisle to Port Carlisle Canal (1823-1853). Click here for a history of the Railway Station at Kirkandrews and the history of the Carlisle to Port Carlisle (1854-1932) and Carlisle to Silloth (1854-1964) railways. Photographs provided by Peter Sowerby of the remnants of the railway and canal that can still be found between Loch House and Wormanby in Beaumont. The area of North Cumbria has some important buildings and interesting building techniques. Click here to view the details of some of the buildings and construction methods of the parish. The history of St Mary's Church, Beaumont. Details of the church commemorative kneelers. Click here for a list of vicars, rectors and priests of Beaumont, Kirkandrews on Eden and Grinsdale dating back to 1296. In 1887, The Rev. T Owen Sturkey MA., the then Rector, wrote a phamplet entiltled "History of the United Parishes of Kirkandrews on Eden with Beaumont". Click here to read the pamplet. Click here to view details of the Kirkandrews on Eden communion vessel. Click here to view a brief history of Beaumont Parish Hall. 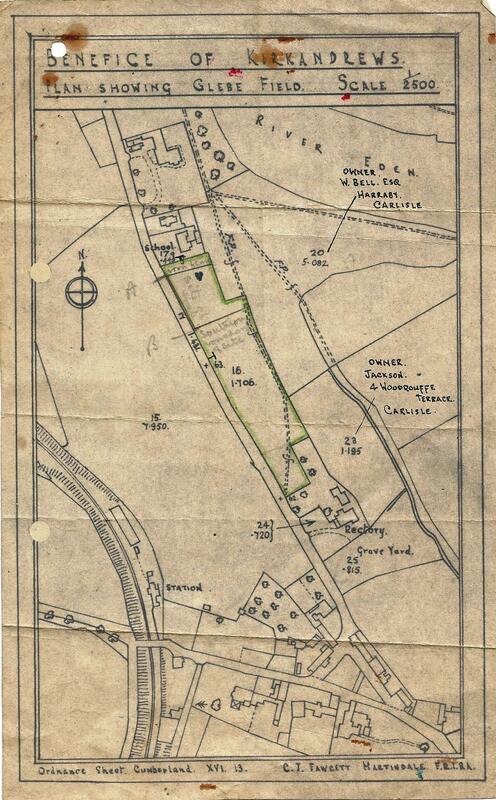 A scan of a pre-1947 map of the Glebe Field in Kirkandrews on Eden now the site of Beaumont Parish Hall. In September 2016 Beaumont Parish Hall organused its bi-annual Flower and Produce Show. To view the winners of each class together with photographs of some of the exhibits click here. Click here to view local traditions and customs of the parish and this area of Cumbria. Two receipts for tenant's rents and fishing tithes dating back to 1655. Parish births. from 1685 -1812. Document excerpts (1703-1939) collected together, in date order, from various books, directories, letters and visitors' reports of the parish. A collection of historical documents of Beaumont, Grinsdale, Rockcliffe and Burgh collated by William Story. Click here for details. A series of handwritten and anotated documents relating to the local History of the parish made by William Story, late of Kirkandrews on Eden. Willaim Story was an amateur local historian. Click to view: document 1, 2, 3, 4, 5, 6, 7, 8, 9, 10, 11, 12, 13, 14, 15, 16, 17. On the weekend of 20th and 21st June 2015, in Beaumont Parish Hall in an event "Special Days", visitors enjoyed an exhibition of 100 years of Wedding dresses and Christening robes, together with displays of associated memorabilia. The event, which had taken over a year to plan and bring about, involved many local families as well as those from further afield, and was supported by a wide range of local businesses. Click here to view photographs of the event. To download "A History of Beaumont" by WT Mcintyre from December 1931, click here. Click here to view details of the Lowther Arms Inn, Beaumont. For references click here. To view collated details of the village of Beaumont, click here. Transcription made by William Story of an account of dues belonging to the "White Book" 1704. Click here to view. Click here to view a brief history of Grinsdale and St. Kentigern's Church. To view collated details of the village of Grinsdale, click here. Click here to view details of the 1827 "Grinsdale assault". Click here to view details of the 1845 "Grinsdale poisoning," a double murder?.Click here to view newspaper copy of the event. Click here to view details of the 1886 "Grinsdale drowning". Click here to view a brief history of Kirkandrews. To view collated details of the village of Kirkandrews, click here. Click here to view William Storey's history of Kirkandrews, written in 1974. Click here to view details and photographs of the "Village Museum" open day in 1978, when the old Rectory in Kirkandrews was shown as it might have appeared when it was first built in 1845. This information was rediscovered in 2014. Click here to view details of the Pound, the enclosed grassed area at the centre of Kirkanfrews. Click here to view details of the Kirkandrews School. Click here to view photographs of Kirkandrews School. Click here to view the timeline of the history of The Old Post Office in Kirkandrew. Click here to view details of the letter box at The Old Post Office in Kirkandrews. Click here to view information about Hollow Creek Farm. Click here to view details of the Scout Camping Ground at Rattlingate. View the poem written by Rev. George Mercer Tandy that was inspired by the break-in at the Rectory in 1855, when the Rev. Brown, was Rector of Kirkandrews on Eden. To view details of the Royal Commission of Industrial Monuments of England Report of Dunkeld, the old Smallpox Hospital of Carlisle, click here. To view collated details of Kirksteads, click here. 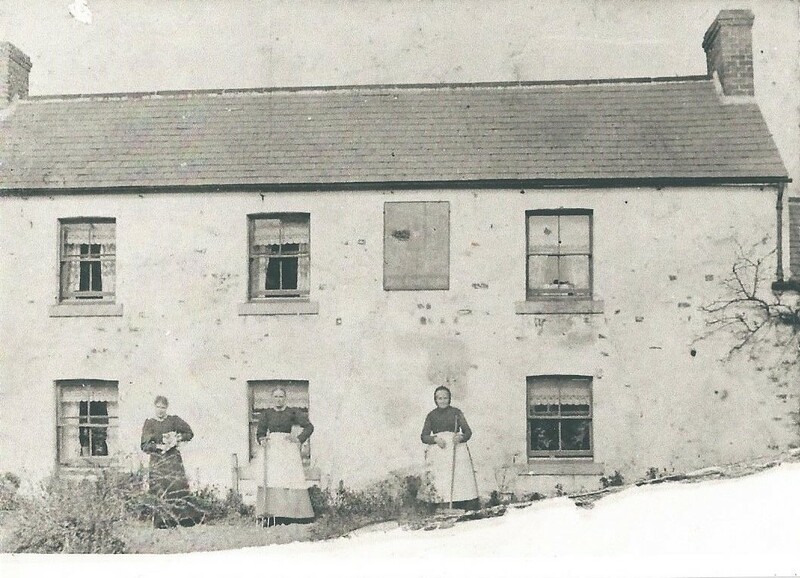 Click here to view details of the excerpt of the 1817 incident in Knockupworth. A history of Monkhill Methodist Chapel. To view collated details of the village of Monkhill, click here. Skating on Monkhill Lough during the winter of 1907. 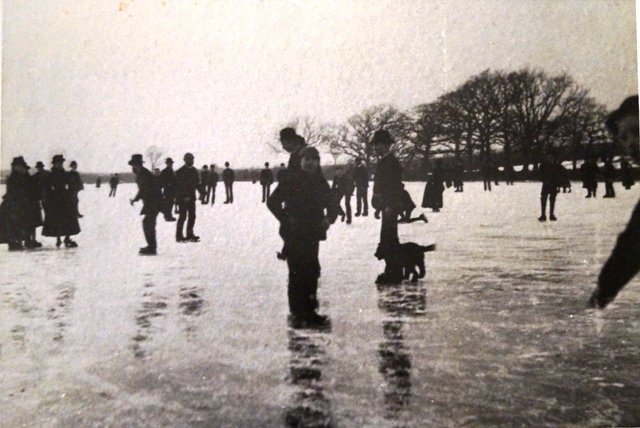 The lough is now drained. The 1724 indenture of the Mill. The 1806 indenture of the mill. Sandsfield in the past was a national and internation trading area due to the local fishing and the Port. view a selection of the fishery reports and newspaer cuttings on the subject on the Respository page. View the petition to the Quarter Sessions in 1759, relating to a cargo of salt which arrived at Sandsfield "damaged by stress of the sea." Click here to view an extract from 1807, "Mr Chapman's Report on the Means of Obtaining A safe and Commodious Communication between Carlisle and the Sea." Click here to view deatils of the 1817 Sandsfield flour incident. Go to our repository page to see maps of the area dating back to 1576. Click here to view details of Mr Oliver, Rector of Kirkandrews and Grinsdale in 1948. References. Click here to view the life story of Agnes Mallinson of Hollow Creek Farm, Kirkandrews. Click here to view a short history of William and Olive Story. Click here to view the obituary of Ann Robinson. Click here to view the obituary of Margaret Vickers. Click here to view details of William & Olive Story of Kirkandrews. Click here to view "A Centurian" about 100 year old Mrs Jane Armstrong, from Memoirs of a Lady Motorist by Olivia Graham, 1916. Go to our repository page to see historical documents relating to the parish including excerpts from various newspapers about people, places and events in the parish. For photographs visit our photo gallery page and select the relevant gallery. Please note that due the the size of some of the documents, downloading may take several seconds. 2014 was the centenary of the start of the First World War. The Parish Council would like to commemorate the Great War by collecting local information from the people of Beaumont Parish. If your family, friends or ancestors were affected by the First World War we would like to hear from you. Click here to find out more details of those who where killed in the World Wars. Details can also be seen at St. Mary's Church, Beaumont. Beaumont: Sydney Armstrong, Albert Barnes, Joseph Herbert Barnes *, Robert Barnes, Victor Barnes, Joseph Beattie, W Harrison, Thomas Henderson, William Huggan, Lieutenant David Johnston MC., George Edgar Ritson Martin, Thomas Moffat, John Morton, William Morton, Robert Pearson, Richard Percival, Wilson Percival, John Strong, Matthew Strong, William Strong, Edward Thompson. Monkhill: Joseph Bell, Joseph Albert Birrell *, Edward Bainbridge Bone *, Mark Crosthwaite. Kirkandrews: Thomas Davidson, Joseph Huntingdon, Thomas Huntingdon, Thomas Johnson, Lieut. Francis E Kitchen. Grinsdale: William Bell Graham, Matthew Hughes, John Little. Old Sandsfield: Benjamin Pearson *. Burgh by Sands: John Morrison Jessamine *. Click here to view details of those who fought in World War I together with details of the memorial and war dead and also the details of those who served and those who were killed as a result of the World War II. Click here to view an excerpt of a twelve old boy's experience of his father serving in WWI. The boy, Tom Goundry, was the great uncle of Beth Nichol of Priest Hill, Beaumont and the soldier, Frank Goundry, was Beth's great great grandfather. Click here to read about the experinces of Dora Michell from Hosket Hill of being a Land Girl during WW2. A newspaper cutting giving a slightly different view on the 1914 recruitment campaign in Kirkandrews on Eden. In 1942 Clementine Churchill, the wife of Winston Churchill, wrote a letter to Mary, Nancy, Elsie and Alice, thanking them for their gift to "the Russians in their brave struggle". Click here to view a copy of the letter.